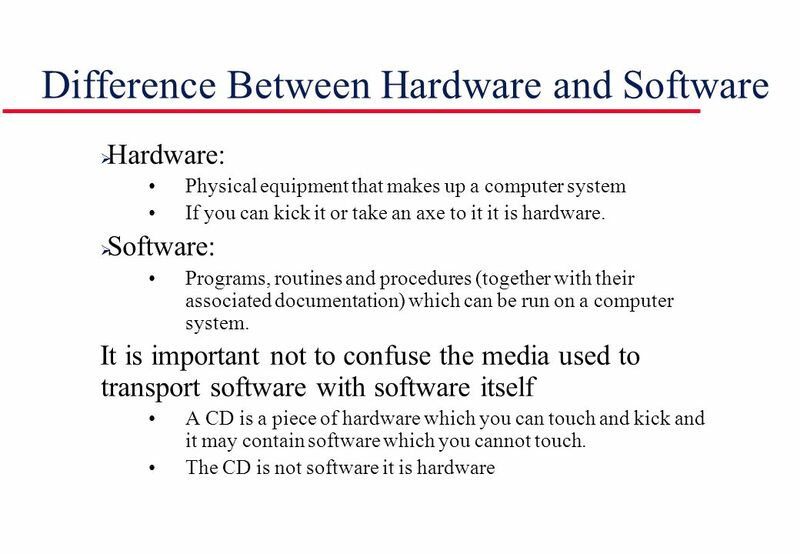 Summary: Difference Between Software and Hardware is that Software, also called a program, is a series of related instructions, organized for a common purpose, that tells the computer what task(s) to perform and how to perform them. While a computer contains many electric, electronic, and mechanical components known as hardware. These components include input devices, output devices, a system unit, storage devices, and communications devices. Software, also called a program, is a series of related instructions, organized for a common purpose, that tells the computer what task(s) to perform and how to perform them. You interact with a program through its user interface. Software today often has a graphical user interface. With a graphical user interface (GUI pronounced gooey), you interact with the software using text, graphics, and visual images such as icons. An icon is a miniature image that represents a program, an instruction, or some other object. You can use the mouse to select icons that perform operations such as starting a program. The two categories of software are system software and application software. A computer contains many electric, electronic, and mechanical components known as hardware. These components include input devices, output devices, a system unit, storage devices, and communications devices. Just like an input device is any hardware component that allows you to enter data and instructions into a computer. Common computer hardware components include the keyboard, mouse, microphone, scanner, Web cam, printer, monitor, speakers, system unit, hard disk drive, external hard disk, optical disc drive(s), USB flash drive, card reader/writer, memory cards, and modem. A communications device is also a hardware component that enables a computer to send (transmit) and receive data, instructions, and information to and from one or more computers or mobile devices.